By making use of quality packing material and with the assistance of our experts, we are able to meet diverse packaging requirements of the clients with ease. Thus, we make sure zero damage at client's end. Wholesale as well as retail consignments of the goods can be undertaken by us with ease. In addition, we promise to make as per schedule delivery. 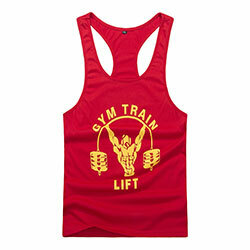 WB-706 Gym Vest has a distinct design with a highly breathable fabric and a high durability.